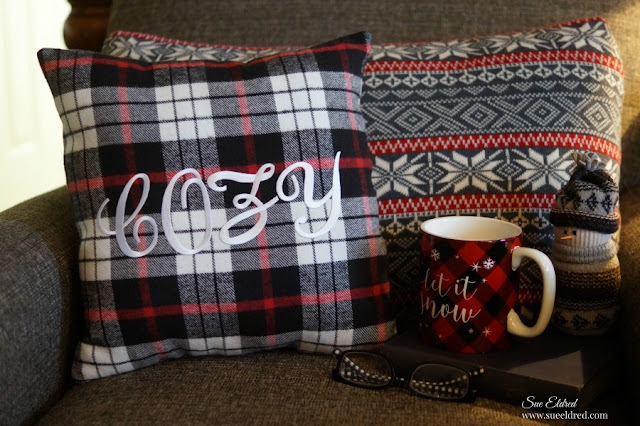 Cozy up the House this Winter with a personalized flannel pillow! 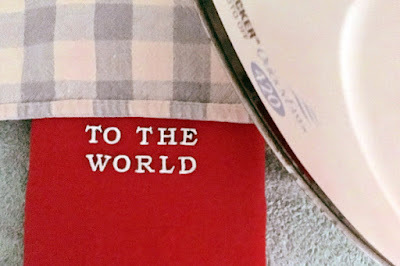 Now that the Holidays are over... it's time to relax, cozy up with a comfy pillow, warm blanket and a good book. 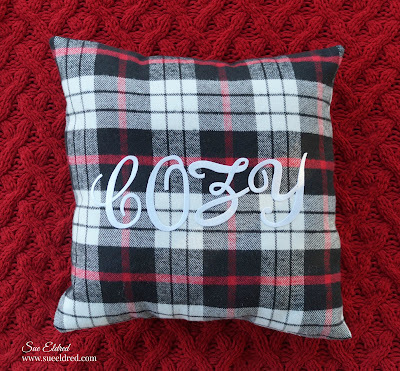 2 Pieces of Flannel - 15" x 15"
With right sides together, sew three sides of the flannel pieces together to create the pillow cover. Turn so the right side is facing out. Position the letters on the front then, following directions on the back of the package, iron in place using a pressing cloth. Let cool then turn the pillow cover inside out and iron again from the back. Let cool for at least one minute, then turn again with the right sides out. 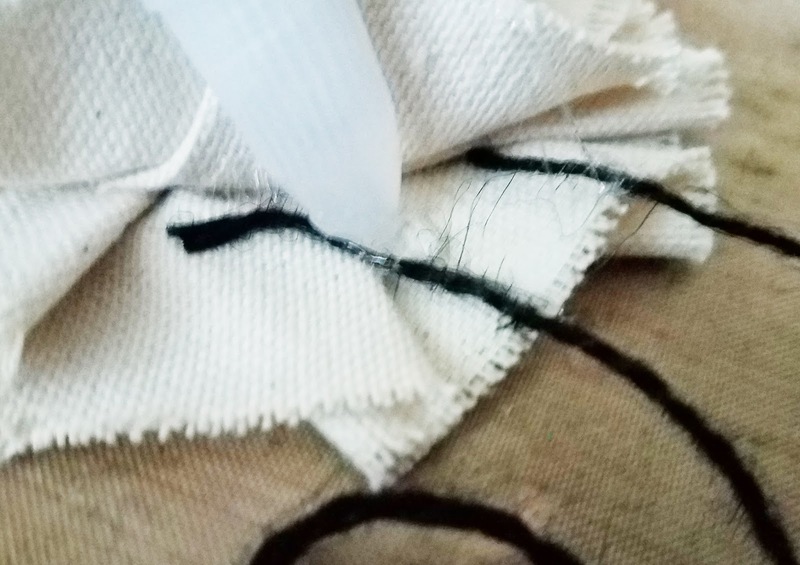 Insert the pillow form then stitch then the pillow cover closed. 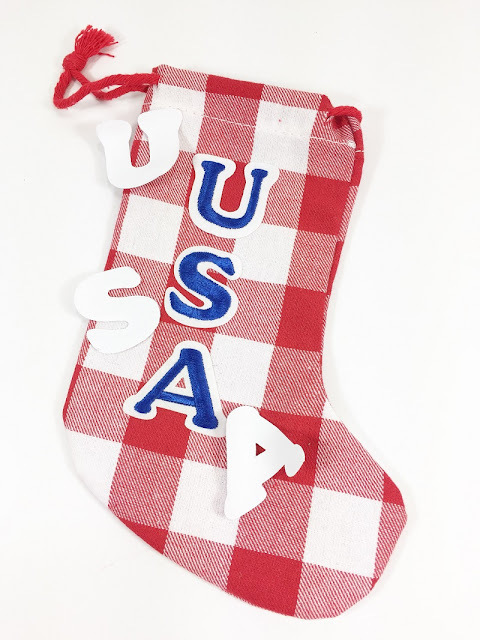 The holiday season can be hectic with parties, travel, family gatherings... no wonder we are worn out! 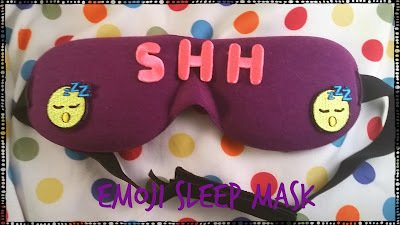 So make sure to recharge your internal batteries with a little rest -- sleep will be even sweeter with this emoji sleep mask! 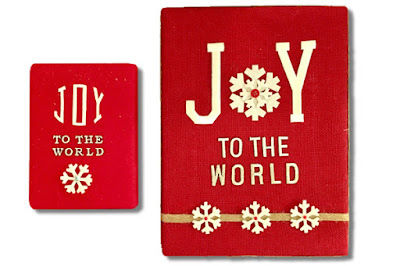 Joy® iron-on embroidered "Chunky" letter sheet. Everyone loves the adorable sleepyhead emojis! 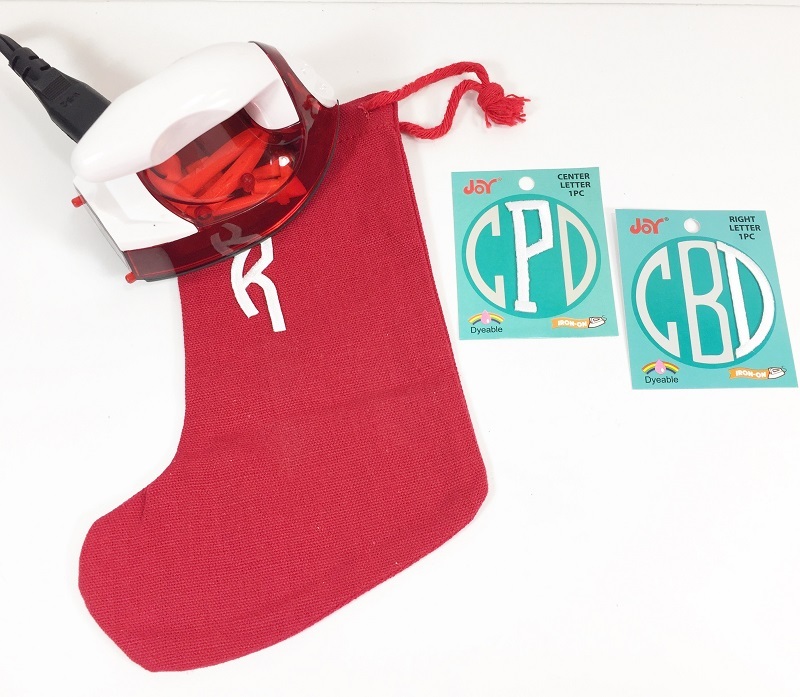 They are so quick and easy to use and can be applied to almost any surface, so end the year by curling up on the couch with a pillow and blanket, putting on this sleep mask, and catching some well-deserved ZZZZZZ's! 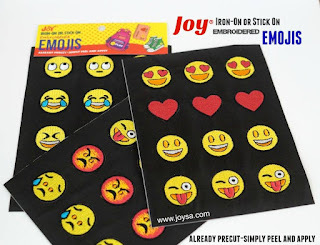 Joy® emojis and iron-on embroidered letters in a variety of fonts, sizes and colors are available at your local craft stores. Time to celebrate like it's 2018! A new year is almost upon us! (How did that happen?) 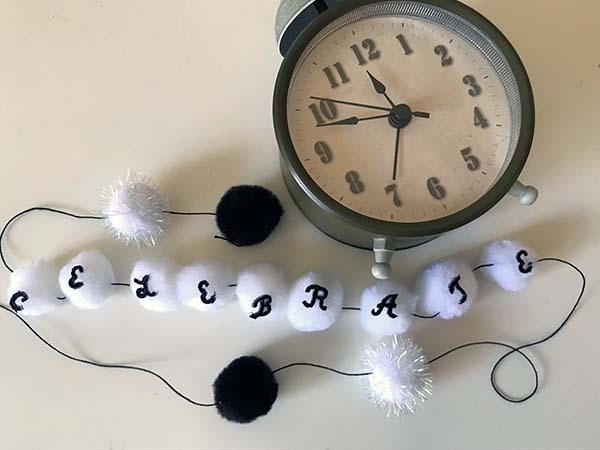 This pom pom garland is a quick and easy way to make your space look festive for any of the holiday activities you have coming up. 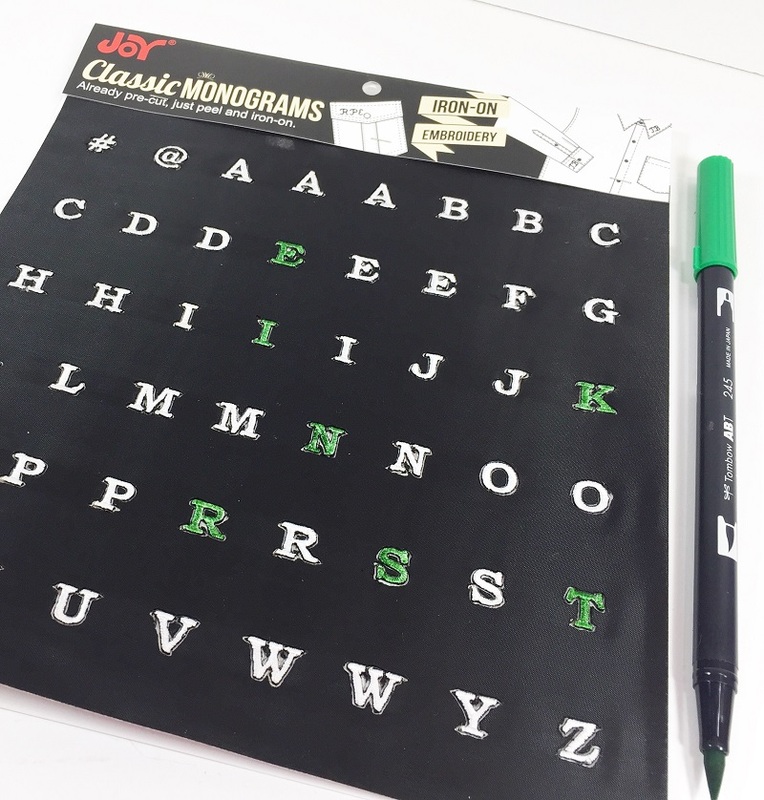 Joy Classic Monograms. 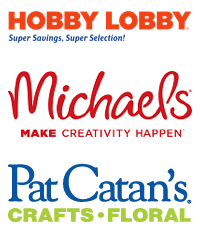 You can find these in your local craft store. 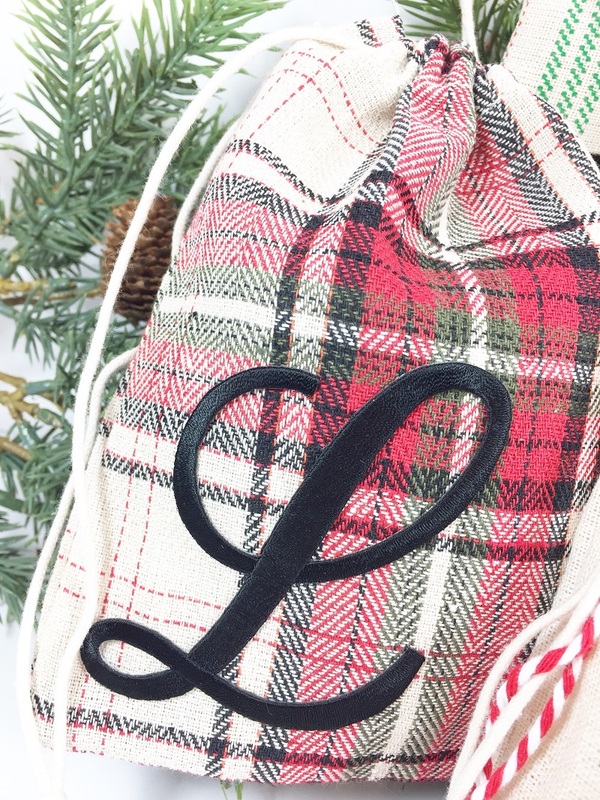 Use Classic Monogram letters to spell out your garland message. 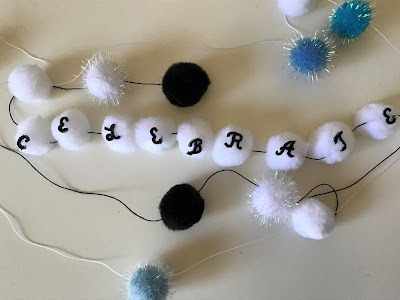 Glue one letter onto each pom poms. Set aside to dry completely. 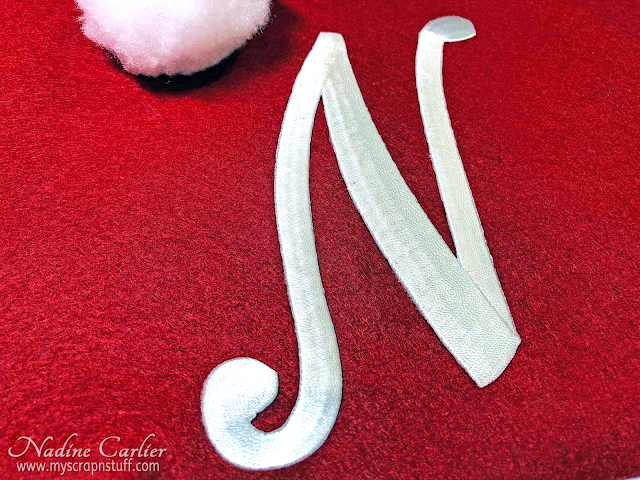 Use a tapestry needle to string the letters (and extra pom poms) onto the embroidery floss. Be sure to keep the letters in the correct order when stringing your garland, especially if stringing from right to left! Happy Birthday - with the name of the person who is celebrating another trip around the sun. Romantic Message for Valentine's Day. The possibilities are endless! What will you make? 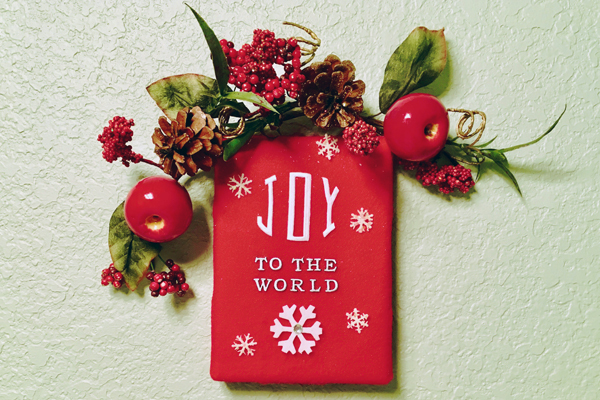 Don't forget to share your pom pom garland ideas on the Creating with Joy Facebook page. 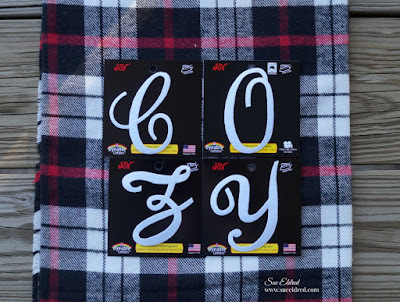 Look for Joy iron-on embroidered letters at your local craft store! 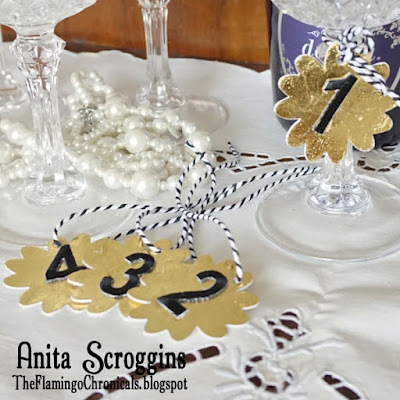 If you're getting ready for a Christmas party, or New Year's Eve you're going to want to have some foiled wine glass charms on hand. When getting together with friends after the rush of the holiday season, it's fun to break out the good crystal stemware and feel grown up. Of course, sometime during the night it's inevitable that someone puts a glass down then can't remember which is theirs. It happens to us all.... Fear not! I have the perfect solution for you. 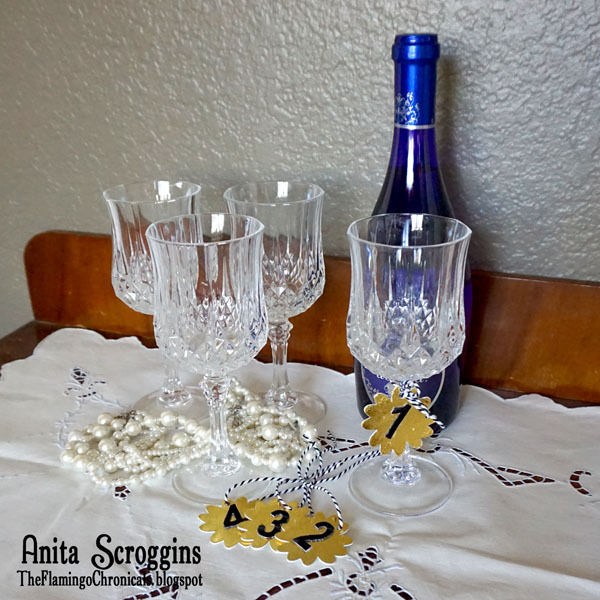 These wine glass charms are fun to make for your own home, or hostess gift!. 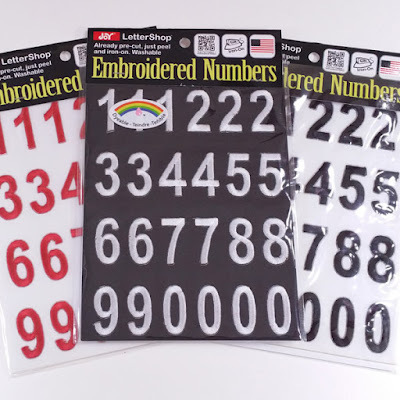 Embroidered Numbers come in a variety of colors to suit any project. 1. 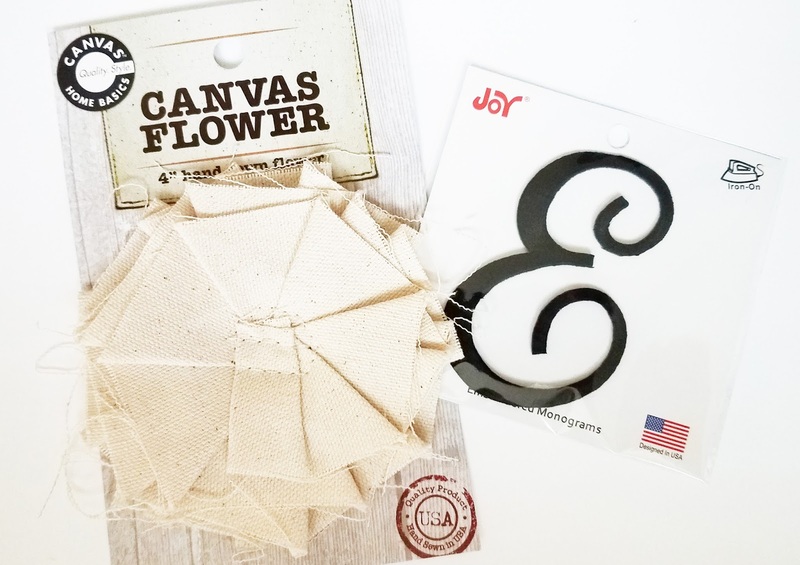 Following the directions on the Deco foil foam sheets, create as many flowers as you need using a die, electronic shape cutting machine, or free hand. 3. Punch a small hole into each flower, then add a piece of coordinating twine. 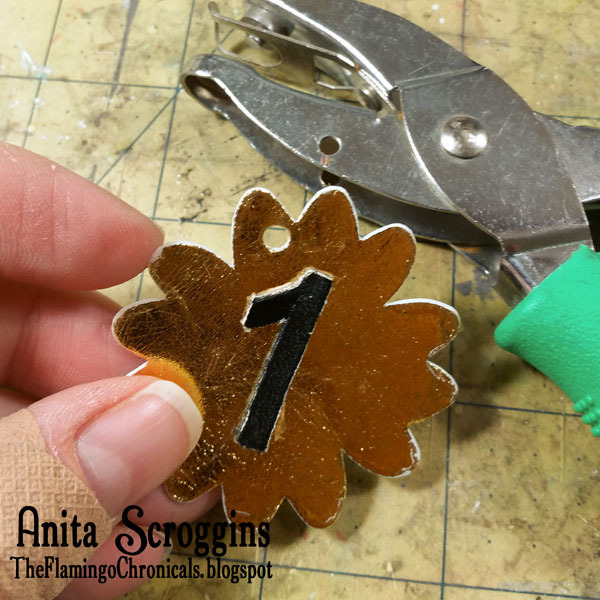 Glue a number to each charm. 4. 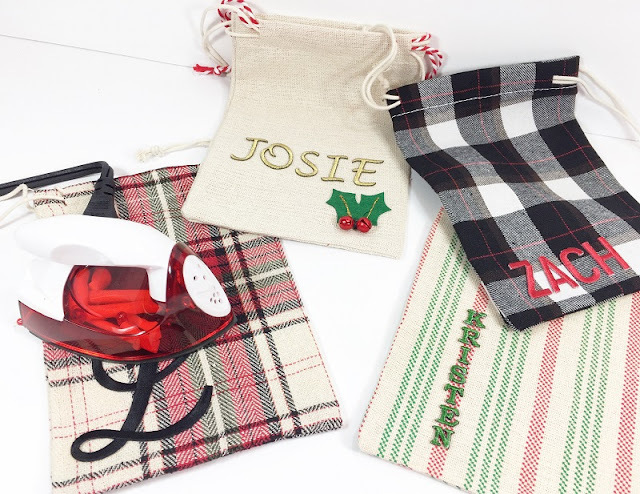 Lay out your amazingly cool charms on the table along with your glasses. Each guest can tie a charm onto the stem of their glass then they'll always know which glass is theirs - no matter where you left it! 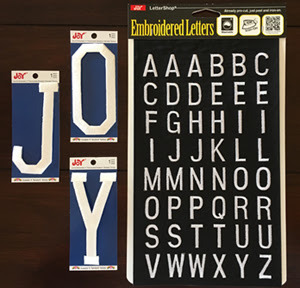 Joy® embroidered numbers and letters are available at your local craft stores. This seriously could not be an easier project - especially at the last minute! 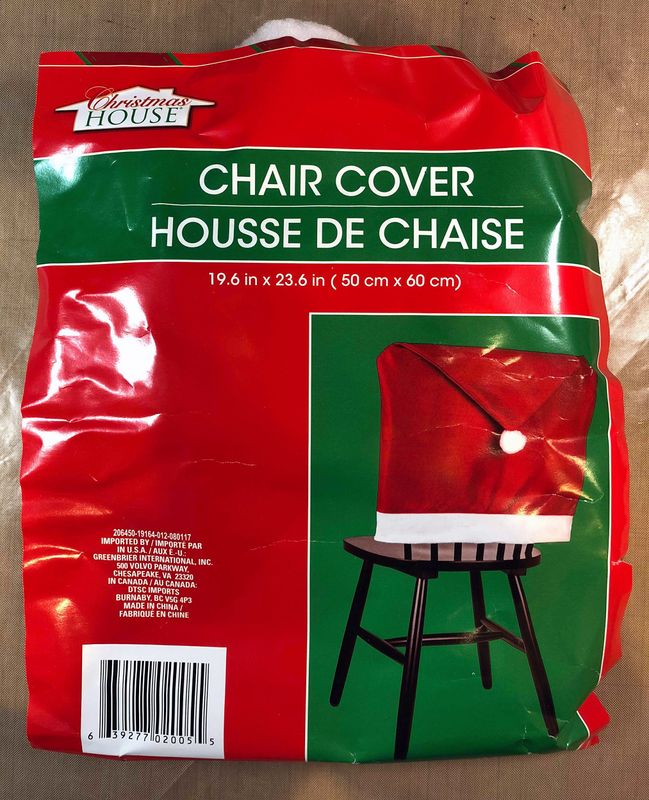 Santa hat chair covers are available at the Dollar Tree and the embroidered letters are available at your local craft stores. 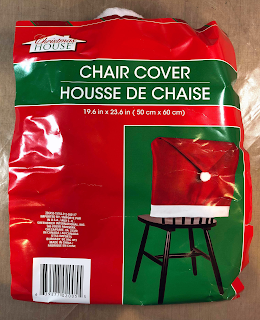 Iron each letter on to the chair cover following directions on the package - EZPZ.... Full alphabet letter sheets are also available, so adding names is just as easy. 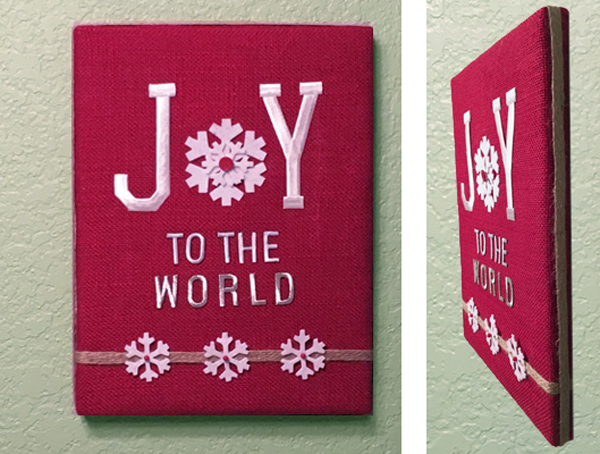 With Joy® embroidered letters you can create frames in any size. These letters are available in different sizes, fonts, metallics and colors and the white ones can be custom colored with dye, markers, or fabric paint. 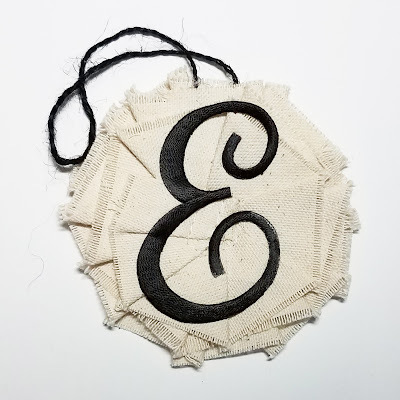 Here are a couple of ideas for inspiration - the same techniques were used for both.... Read more to see how easy they are to make - large or small, you can make them all! 1. 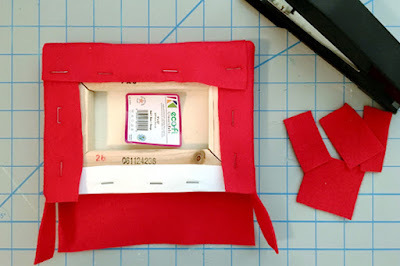 To cover the frame, center the fabric on the front, wrap around to the back then staple in place. 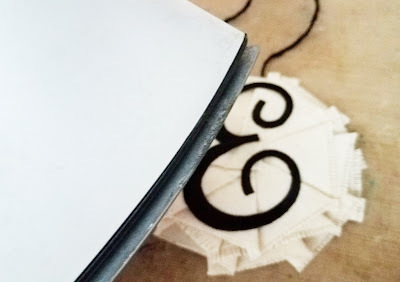 Cut away extra fabric at each corner for a neat finish. 2. Starting with the center letter position the letters and snowflake on the front. 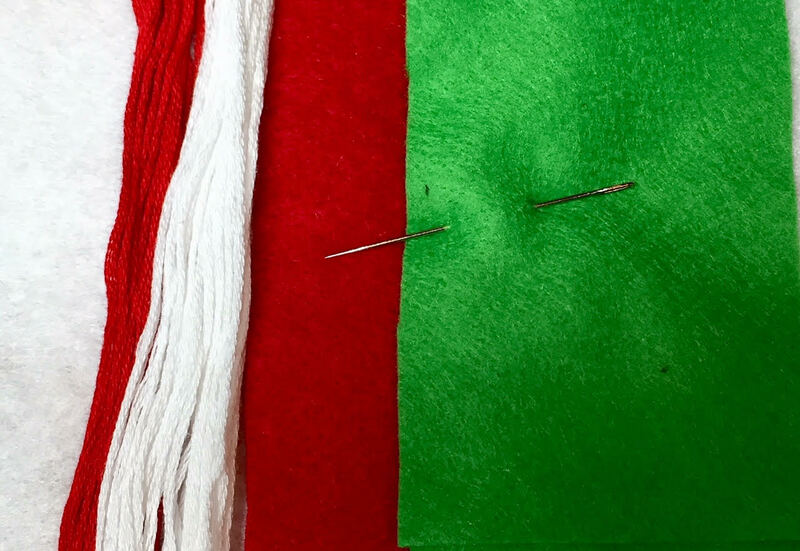 Nudge the small ones in place with the tip of small sewing scissors, or toothpick. 3. 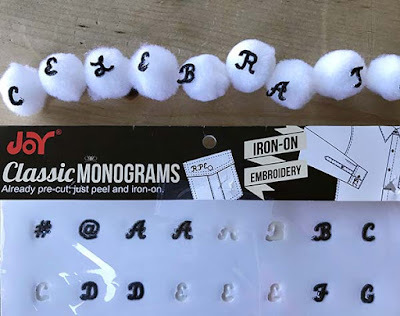 Following directions on the back of the package, iron the letters in place, one row at a time from top to bottom. Note: It may be necessary to use a small amount of fabric glue to secure the tiny monogram letters to the felt. 4. 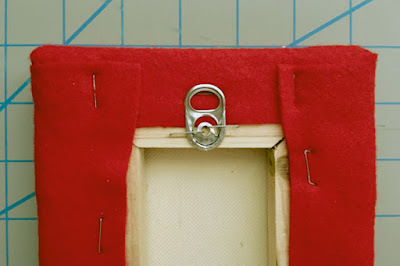 Staple a soda can tab to the back of the frame for a hanger if needed. 5. 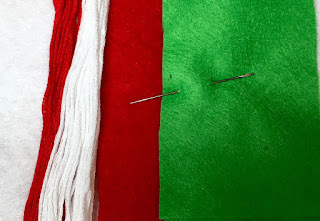 To finish, add a tartan ribbon across the bottom if desired then staple the ends to the back. 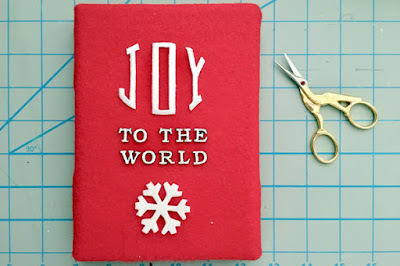 Adhere the felt snowflake then add smaller ones and a gem to the center of the snowflake. There are so many different ways to customize. 6. 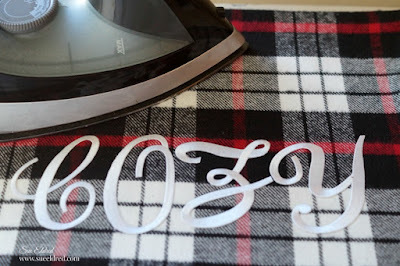 To make the large plaque, you will need Joy individual 2" letters and a metallic silver letter sheet. Follow the instructions above. 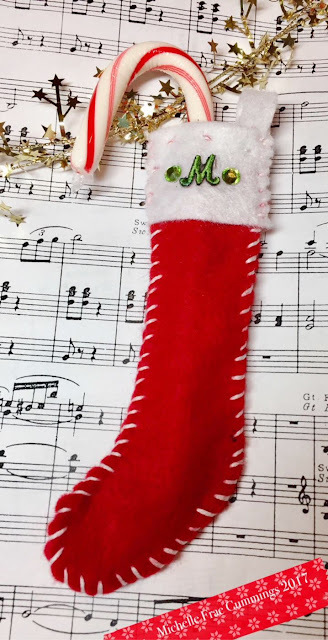 Note: After arranging the letters on the front of the frame, I substituted the letter "O" with a large snowflake then placed one of the smaller ones on top. 7. Position 1/2" burlap ribbon across the frame about 1 1/2" from the bottom as shown, then staple the ends at the back to secure. 8. 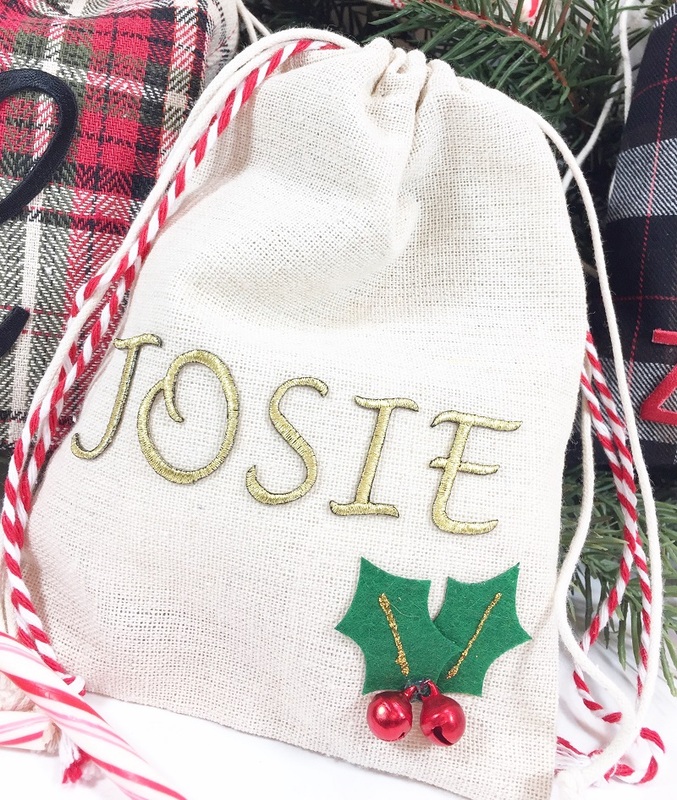 Wrap the burlap ribbon around the outer edge of the frame to finish. 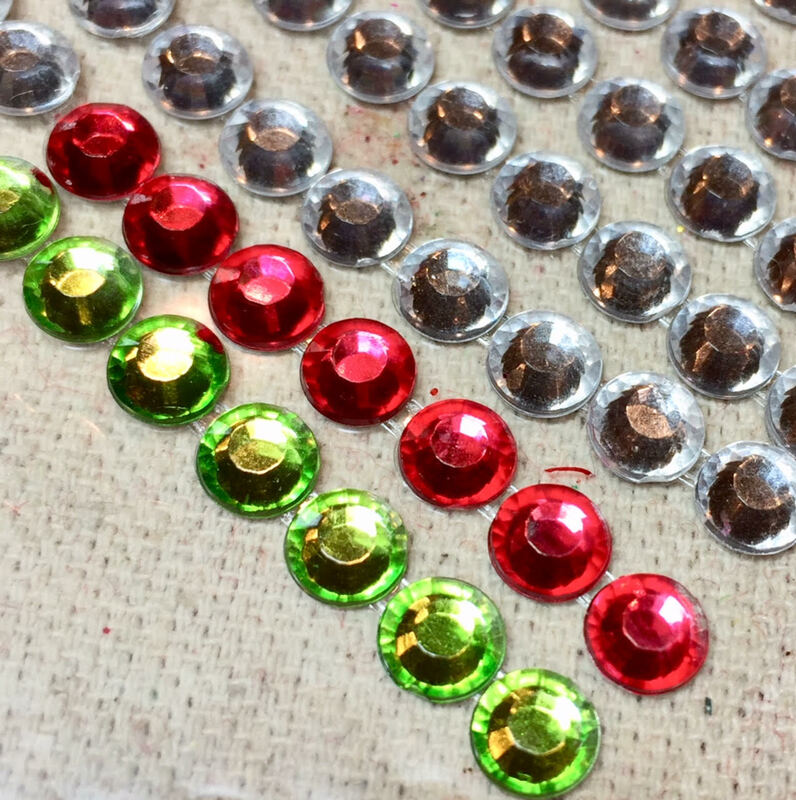 Add a small red button to the center of the large snowflake and a red quilt pin to the center of each small snowflake. Bend the ends of each quilt pin back for safety. 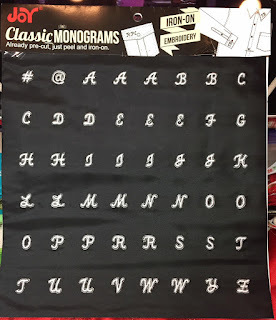 You can find a wide variety of Joy embroidered letters at your favorite craft store. 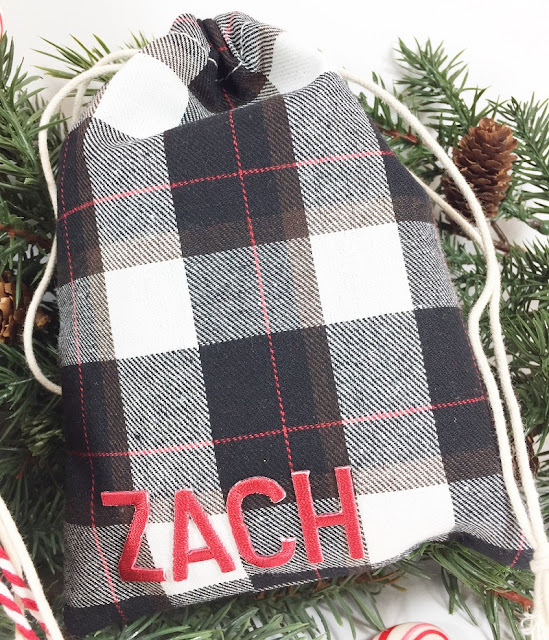 There are so many fun, personalized ornaments out in the stores right now, why not make your own? 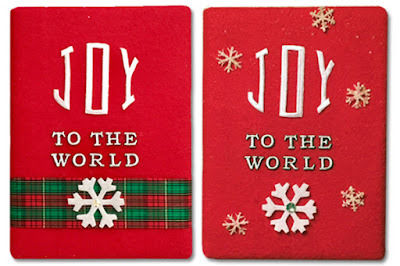 It is super simple with Joy® since you can pick your color and item you want to add it to. 1. Carefully remove the letter from the fabric backing and place on to the center of the flower. 2. 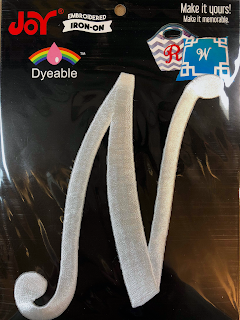 Referring to directions on the back of the package, iron the letter in place on to the flower. 3. 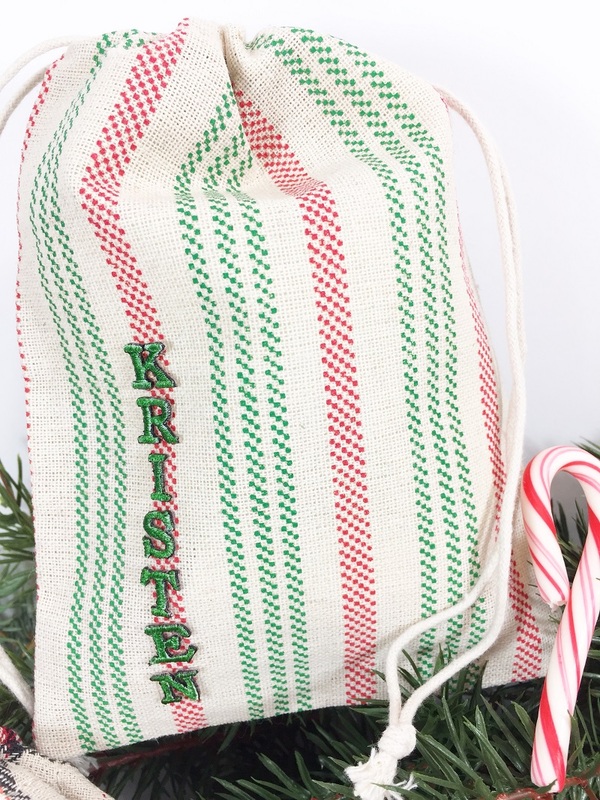 Glue the twine to the top as the hangar for the ornament. You can now hang the ornament on your tree or use it as the bow for a rustic present! These miniature stocking candy cane holders are just the right size to adorn a package or hang on a tree! 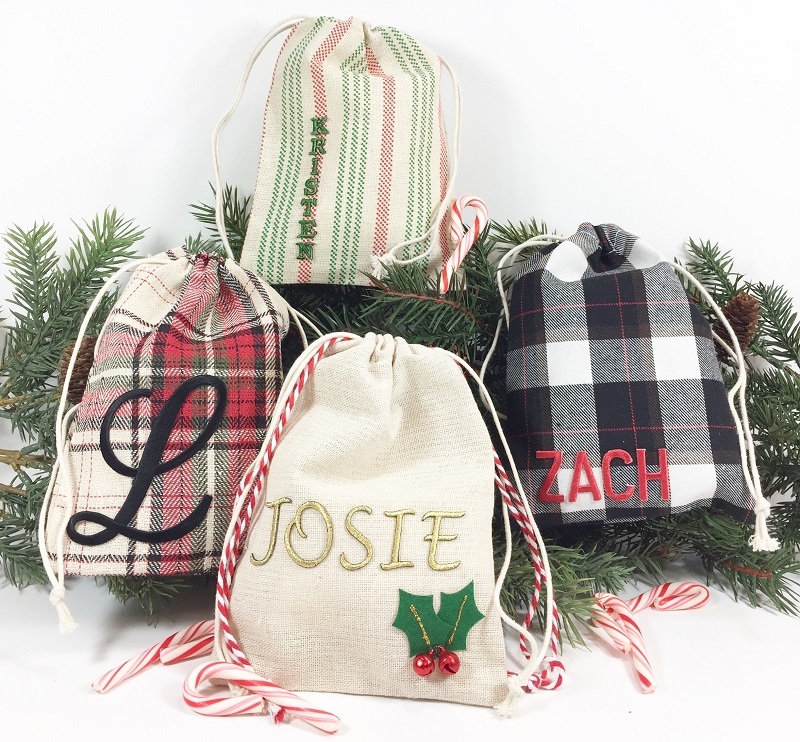 This is a fun craft the whole family will enjoy! 1. 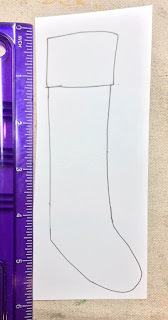 Draw a stocking pattern similar to the one shown. 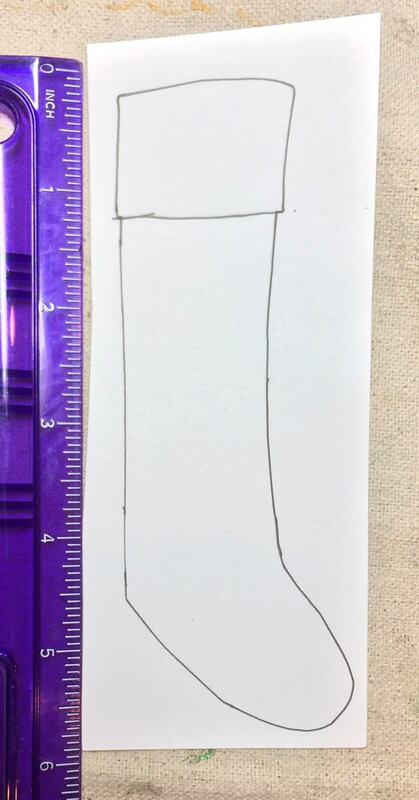 It should be at least 1" x 6", large enough to comfortably hold a candy cane. 2. 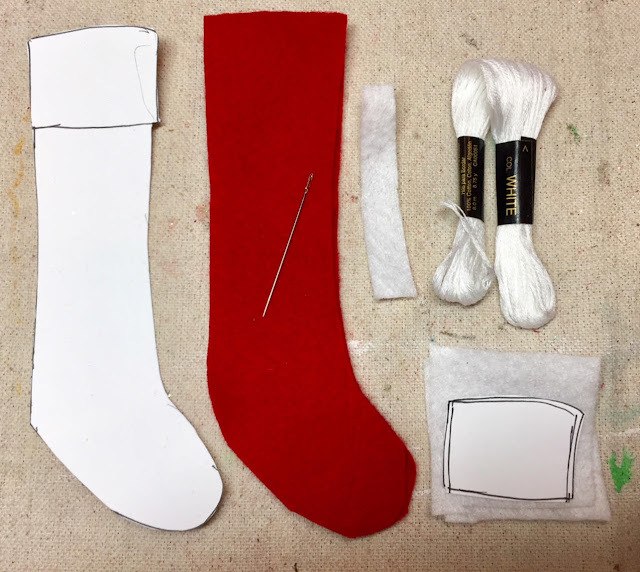 Trace the stocking pattern onto felt. 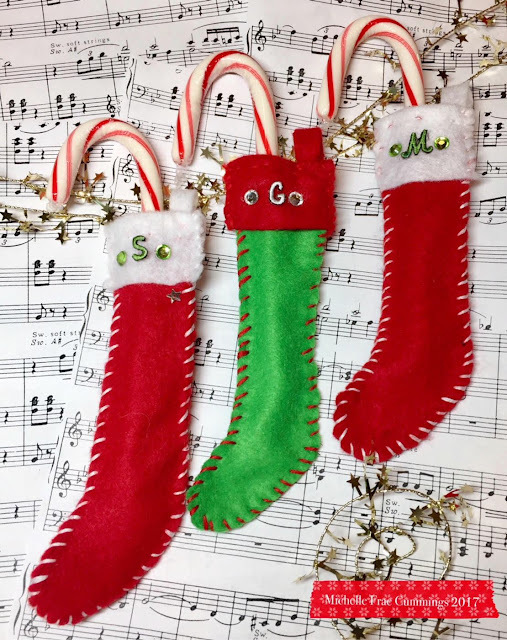 You will need two pieces for each stocking. Cut two cuffs from white felt for the top and a strip of felt, about 3/4" x 4" for the hanger. 3. 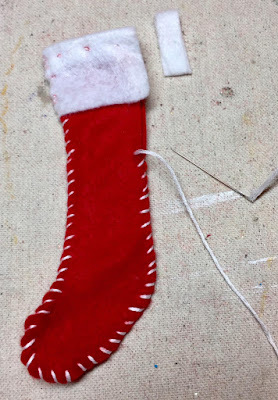 Use a simple running stitch about 1/2" from the top edge to attach a cuff to the top of each stocking. Fold over at the top, then stitch in place along the top edge. 4. 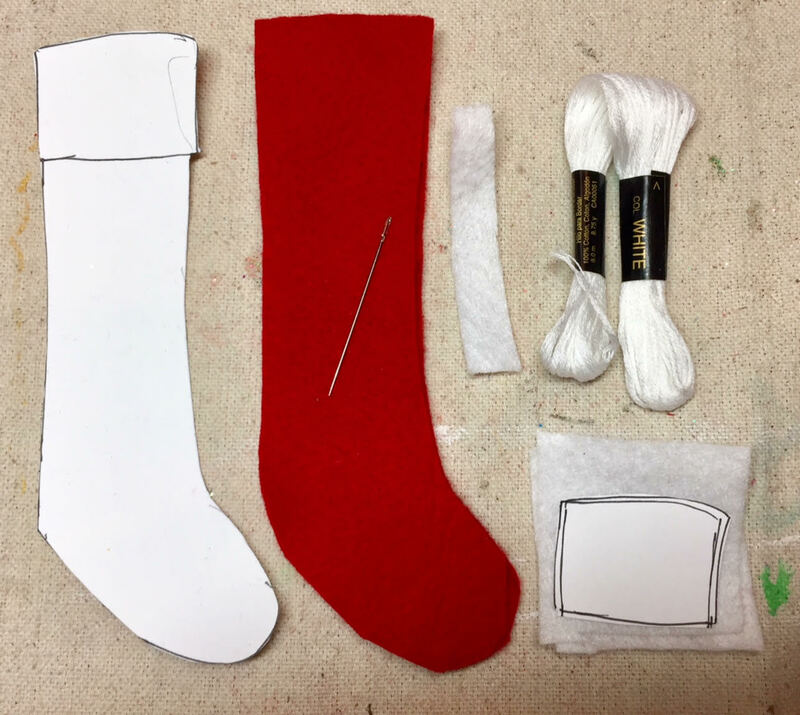 With the cuffs on the outside, place the two stocking halves on-top of each other, then starting at the top edge, stitch the pieces together. Add the hanger at top edge as you finish. 5. 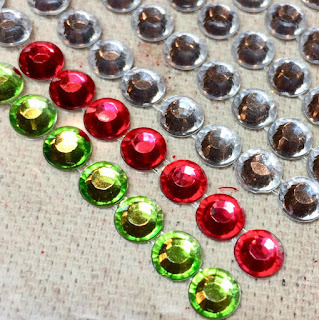 Use the markers to color the letters and Rhinestones to match the color of felt. 6. Glue the letters and rhinestones to the top of the stockings. 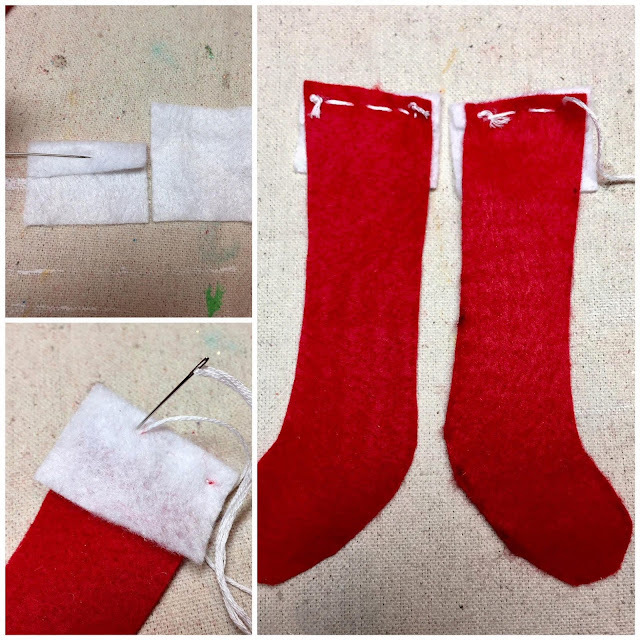 Allow the glue to dry, then place a candy cane in each stocking for all to enjoy! I absolutely LOVE the holidays, but now that my nieces and nephews are getting older the big stacks of presents have been replaced with gift cards and electronics. 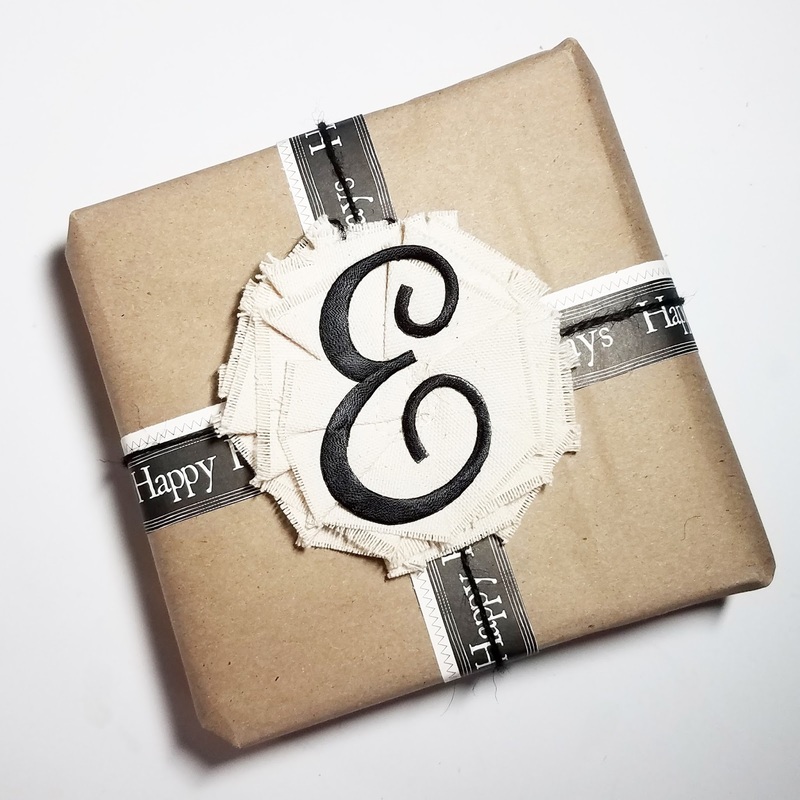 So how do you make those sometimes impersonal gifts extra special? It's all in the wrapping! 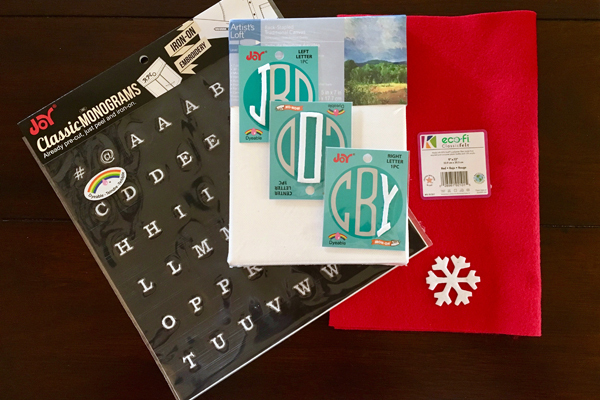 Gather some pretty simple supplies - a variety of Joy® Iron-on embroidered letters, mini fabric gift bags and stockings (I found mine at the Target dollar spot) and an Iron. For the striped gift bag I colored Joy® Classic Monograms with a Tombow Dual Brush marker. 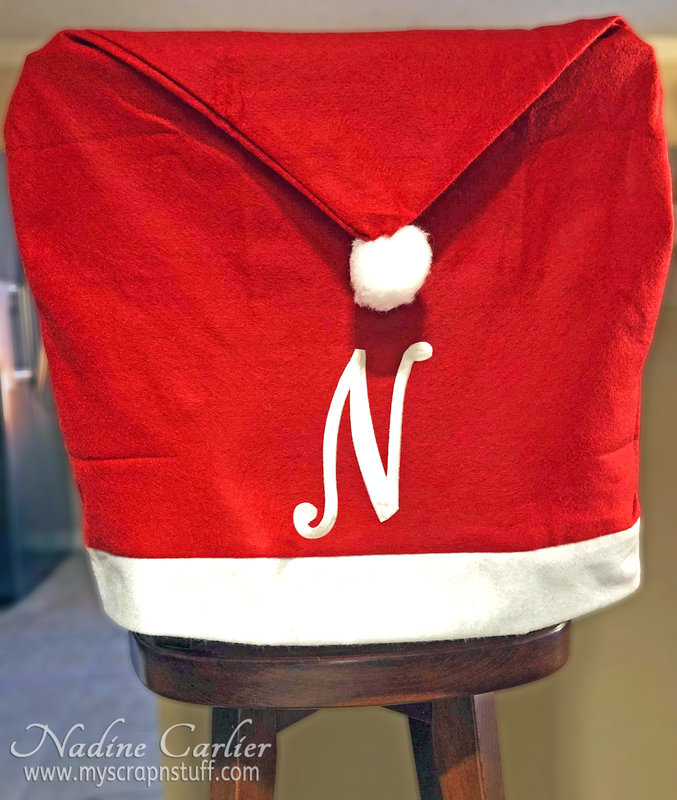 On the red stocking I added a Joy® Circle Monogram in white with a craft iron. 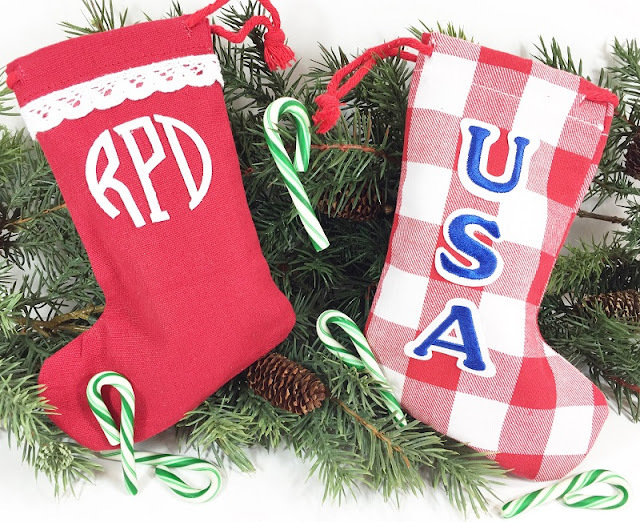 For my friend who is deployed overseas, the red and white gingham stocking received a patriotic USA with Joy® Cooper peel and stick letters in royal blue. 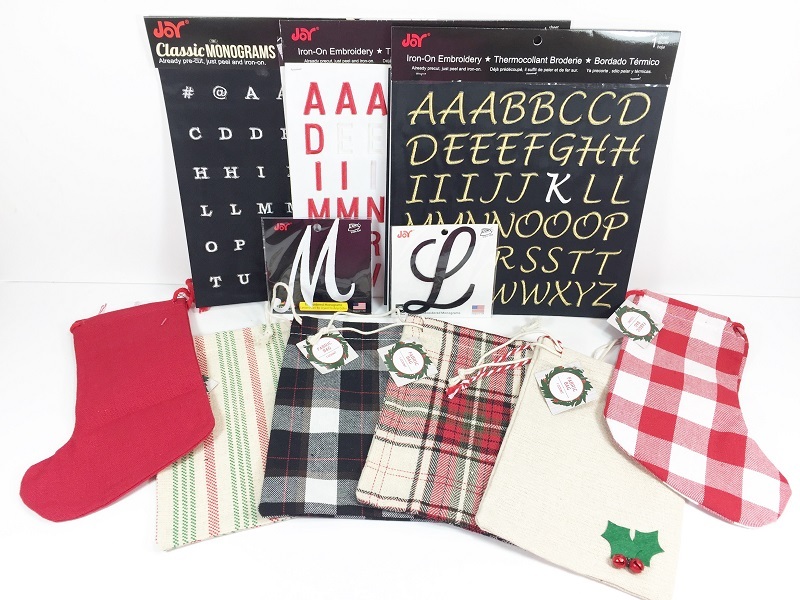 I mixed and matched the rest of the gift bags with my favorite Joy® iron-on embroidered letters and monograms. Letters are applied with an iron according to the directions on the back of the package. Here are close up shots of each bag. 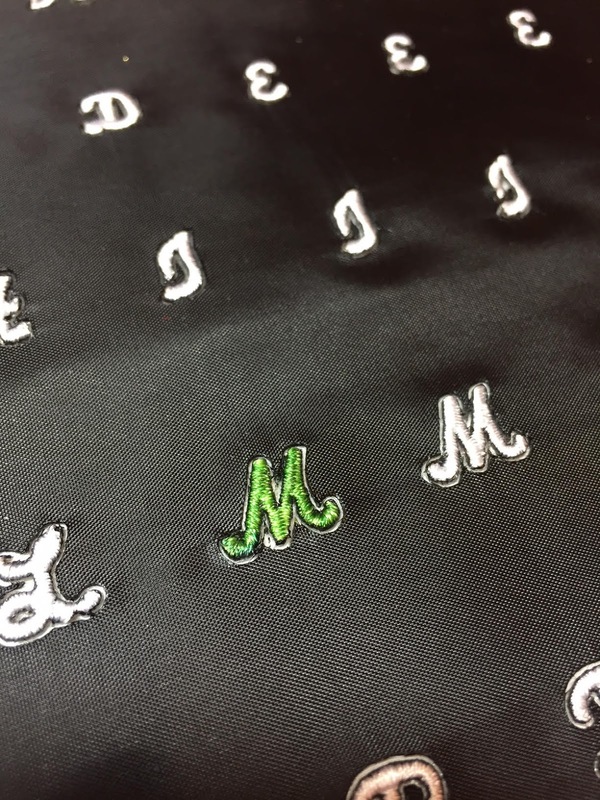 Monograms with lace and the good old red, white and blue for Rhonda as she serves our country in Afghanistan! Now I'm off to fill these quick and easy personalized holiday gift bags with all kinds of Christmas goodies! All six went together in just under 30 minutes!